Add a Second Hard Drive to your HP Pavilion dv5 Series laptop using your laptop's optical drive bay. 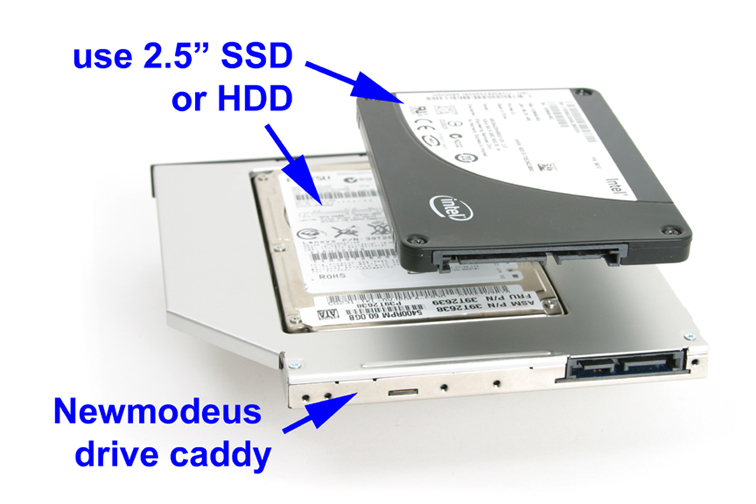 This is a great solution for those that want to add a 2nd hard drive, or 2.5" SSD! Add it as a second drive in the laptop in lieu of the SATA Optical drive. This device/caddy will fit in the CD/DVD/Optical drive bay in your laptop. NOTE: The caddy's standard faceplate is Black, flat and rectangular. It is not an exact match with the Pavilion dv5 Series laptop. But you can also transfer your optical drive's "original faceplate" to our caddy for that more custom look. The metal bracket has mounting screw-holes so you can attach your original optical drive's "mounting brackets" to our OBHD caddy (see photo below) .